Evert Pieters was born in Amsterdam on December 11, 1856, and studied at the Academy of Amsterdam and at Thomas Verstraete in Brasschaat (Belgium). Pieters worked and lived in Amsterdam until 1874, moved to Den Haag (Holland) in 1874 and in 1876 he went back to Amsterdam, until 1879. 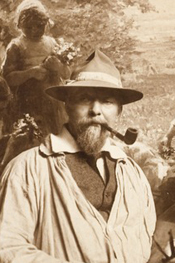 He continuously moved, next to Antwerp from 1879-1880, then to Volendam, Haarlem until 1895, Paris from 1896-1897, Blaricum till 1905, Katwijk till 1908, Blaricum again until 1917 and finally Laren, where he died while riding in a taxi from Baarn to Laren. Until the age of 19 he studied painting at home and then went to Antwerp as a scenery painter. He took night classes with Charles Verlat for two years and later studied with Thomas Verstraet. He painted, drew and sketched landscapes, but became famous for his interior scenes at Laren and beach scenes with fishermen. 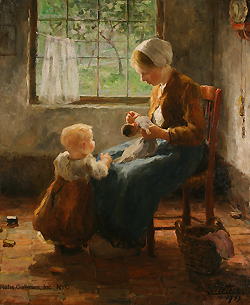 Pieters exhibited his work in Amsterdam from 1895-1905, Maastricht in 1896, and Arnhem in 1901. He won a Gold medal at the Paris Salon in 1896, another medal in Barcelona in 1898 and a monetary award at the l’Exposition Universelle of 1900 in Paris. During World War I he sojourned to London. 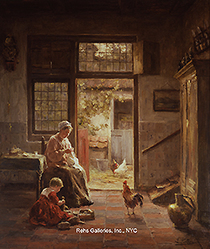 Pieters’ work continued to evolve after his return to Holland, tending towards more atmospheric art and brighter colors. The major parts of his landscapes are scenes from the Campine (a natural region situated chiefly in north-eastern Belgium and parts of the south-western Netherlands which once consisted mainly of extensive moors, tracts of sandy heath, and wetlands) and in Holland.